Collagen is breaking through capsule and tablet formulations and is going far afield in providing consumers with a range of intake options. For a long time, there was this idea that collagen was a useless protein source because it’s not a complete protein, namely because it lacks the amino acid tryptophan. But then again, with 30 percent of the protein in the body being collagen, maybe the body respects it more than we’ve previously imagined. That biological affinity may be the prime reason for the rapid growth of collagen in the market. “Collagen is an incomplete protein, but it is complete for 30 percent of your body,” says Tonja Lipp, senior manager of business development of health and nutrition at collagen supplier Gelita USA, which markets the Verisol trademarked collagen for skin health. Collagen today is not just an inexpensive protein source. It also rings the bell for paleo diet aficionados in hot products like bone broth. Collagen is found in skin, cartilage, tendons, bone and muscle tissue. One-fifth of total bone mass is collagen, and fully 95 percent of the organic bone matrix is collagen. It also comprises 75 percent of skin and 70 percent of cartilage. After age 30, collagen degrades at a rate of about 1 to 2 percent each year. No cow has ever died for its collagen. It’s a classic waste-stream product, derived from the process of making gelatin, only hydrolyzed collagen treated with enzymes does not gel. Collagen is the latest vanity play ingredient—2.5 grams a day has positive effects on facial skin hydration, elasticity and roughness (Sugihara, 2015). Other studies add wrinkle reduction as another benefit (Inoue, 2015). And it doesn’t seem to matter the source—cow, pigs or fish, it’s all good in the collagen world (Koizumi, 2017). Seen one, seen ’em all? However, while on the surface it seems one collagen is as good as another, technology innovators can alter raw collagen to provide a range of health benefits. That’s because peptide fractions of collagen can make a significant difference, determining whether the collagen powder is a simple protein source or provides a skin-health benefit. Collagen types 1 and 3 are derived from either fish, bovine or pork. A 2.5-gram dose gives skin-health benefits, while levels up around 10 grams give joint-health benefits. Type 2 collagen comes exclusively from chickens and is used at much lower doses for joint health applications. The interesting aspect of collagen is that it works in a different way from most nutrients, wherein when consumed, the nutrient makes its way to the nearest deficiency and the body fills up. Then collagen provides the amino acid starting materials for new collagen creation. But collagen peptides pieces cut into smaller peptides in different sizes stimulate the body’s own collagen metabolism. The central questions for innovators in the collagen space is which enzymes to use to cut the large peptide proteins down to size and how long to use the enzymes. “Given the complexity of collagen and the various types, sources, molecular size, composition, and manufacturing methods, it is important to avoid drawing comparisons or conclusions on their mechanisms of action based on simplistic variables,” says Suhail Ishaq, president of ingredient supplier BioCell Technology. Seven human clinical trials support the safety and efficacy of BioCell Collagen and it carries a Health Canada health claim about both joint pain associated with osteoarthritis and maintenance of healthy skin. With the Verisol collagen ingredient, one study showed a 65 percent increase in collagen production and a 20 percent reduction in wrinkles in eight weeks (Proksch, 2014). For Nitta Gelatin, one collagen ingredient has effects on pressure ulcers or bed sores. Nitta also uses two key dipeptides, proline-hydroxyproline and hydroxyproline-glycine, that demonstrates a significant difference in skin moisture retention and elasticity, thus showing a reduction in wrinkles. Another peptide benefits those with osteoarthritis, says Nelson. The other difference that can come with different supply sources of collagen is taste. This can influence product formats, which is increasingly important because collagen is breaking through capsule and tablet formulations and is going far afield in providing consumers with a range of intake options. Powders are foremost, but product developers are rolling out bars, beverages, even tea bags with the efficacious dose of 2.5 grams. “When you taste pure collagen powder and you have a high-quality collagen peptide,” says Lipp, “it’s a white powder you dissolve in water, you get a neutral taste but a little animal taste.” She says collagen is comprised of roughly 90 percent protein, 8 percent water, 2 percent ash. It is only the tiny traces that give it its flavor. NeoCell markets the No. 1 collagen SKU in the natural channel and is now moving aggressively into the cooking space, working with chef influencers and rolling out two collagen cookbooks. But collagen for anti-aging effects like skin health and joint health? Science says there is a there there. 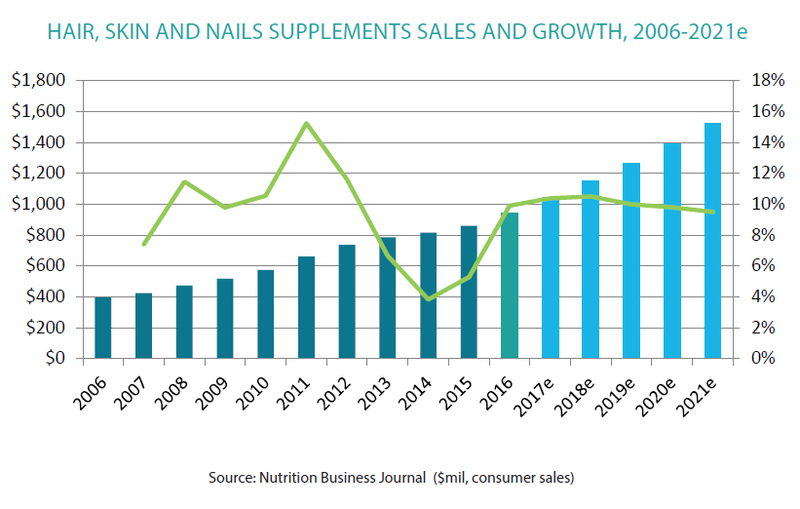 And with the innovations around new finished product development, we can expect to continue to see collagen selling well until we are all old and (not) wrinkled. This article appears in the Innovation issue of Nutrition Business Journal. The full issue is available for purchase here.